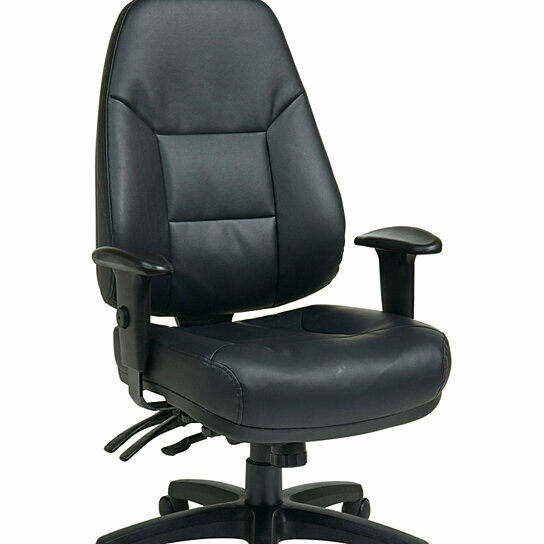 Deluxe Multi Function High Back Black Leather Chair with Ratchet Back and 2-Way Adjustable Arms. Thick Padded Contour Seat and Back with Built-in Lumbar Support. Seat Size: 20.25W x 19.5D x 5T, Back Size: 20.5W x 26.25H x 5T, Maximum Overall Size: 27.25W x 26D x 48.5H, Arms Maximum Inside: 20.75, Assembled Net Weight: 56 lbs. Color: Black. Fabric Material: 20% recycled leather, 20% Fabric, 60% Polyurethane. Outer Materials: Metal, Nylon, Bonded Leather.